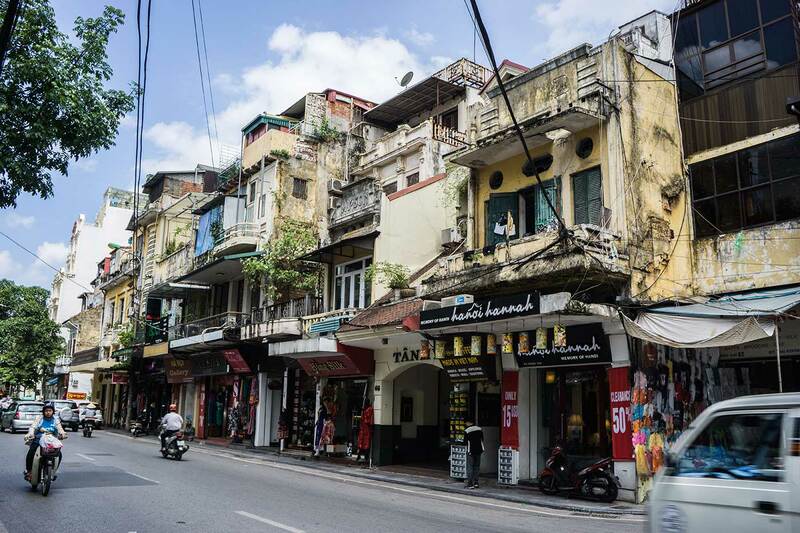 Visually, you can see the effects of the last 100 years on its cities from the French influence in architecture in Hanoi to the Vietnam War remnants near Ho Chi Minh. If it were not for the visuals you would be surprised to learn of any war or conflict simply through how friendly, humble, and kind the people are. It is not that they want to forget the past, rather they seem more interested in the future. We split our time learning about the past and the present. While the past helped our understanding of the present day, it was not nearly as interesting as learning about Vietnamese culture today. Vietnam is a beautiful country, frequented by backpackers. Literally a “choose your own adventure”, you could spend your time lost trekking through the hills of Sapa, or simply laying on a beach in Hoi An. We opted for a mixture of adventure and relaxation with our two week itinerary spanning the length of the country. Our arrival in Hanoi was greeted by some of the nicest, friendliest people that we have met on our entire trip. We opted to stay in the Old Quarter district of Hanoi which is an intensely loud and “in your face” area. Had we not traveled directly from China and Hong Kong it would have led to immediate culture shock. Any shock we may have experienced was washed away with a welcome drink at the Oriental Central Hotel, an incredible budget hotel with the best service and friendliest staff we have experienced on our entire trip! We would HIGHLY recommend staying here. Venturing out into the hustle and bustle, we enjoyed our many different culinary experiences. Bun-cha (pork), cha-ca fish at Cha Ca Thang Long (grilled white fish with turmeric, fresh dill, herbs and green onion), Bun Xao (pancake style taco with fresh herbs and shrimp/pork), fresh spring rolls, Hue style food, and pho (noodle bowl) topped our list. 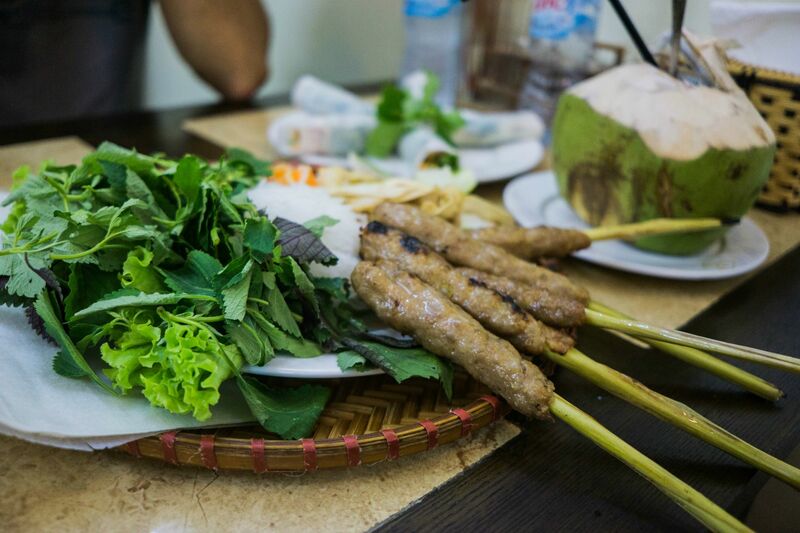 Natalie's favorite food in Hanoi - Hue influenced lemongrass skewers. In addition to great food, the coffee scene was incredible. Off a hot tip from our walking tour guide, we enjoyed coconut coffee (similar to an affogado, coffee with coconut ice cream) at Cong Caphe and the specialty of Hanoi, egg coffee. 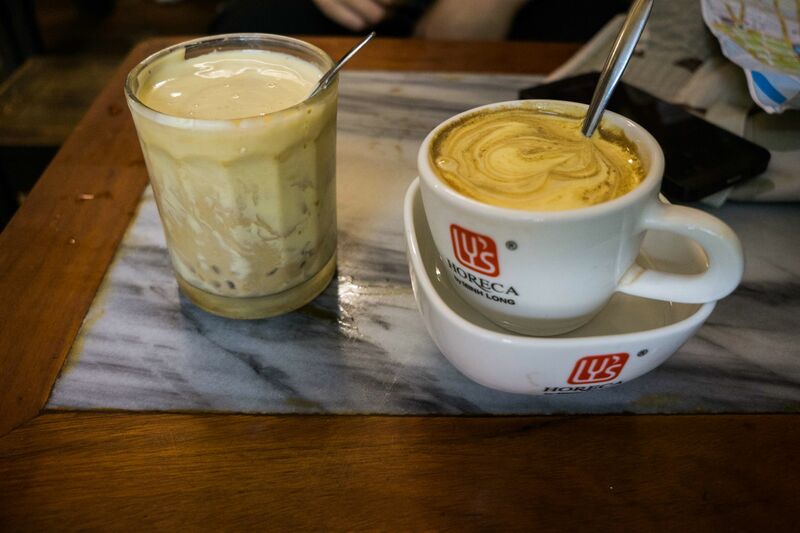 The standard cup of joe in Vietnam was sweeter than most western coffee, mostly due to the use of condensed milk. Egg white coffee in Hanoi. Enjoying a local beer on the streets was one of our favorite experiences in Hanoi. Bia Hoi (fresh beer) may be had on almost any street corner in Hanoi for roughly $0.25 per glass. Rumor is that Bia Hoi is made daily and that it turns bad if not consumed the same day – but we couldn’t find anyone to confirm this for us. 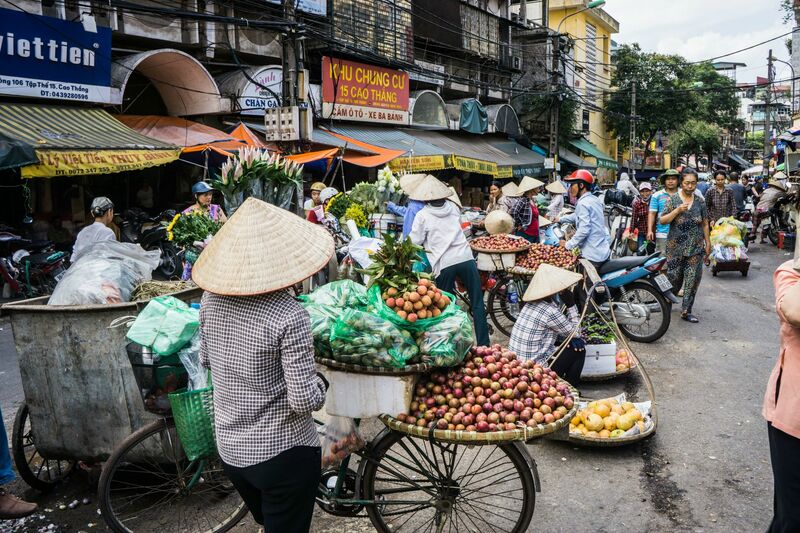 As the prior capitol city of Vietnam, Hanoi continues to amaze with its mixture of French and Asian influences. The many street vendors, markets, and shops matched with the tiny streets made for an intense but pleasant first experience in Vietnam. One of the pillar destinations on our trip, Halong Bay fascinates with over 2,000 islands. It is a brief 3.5 hour car ride from Hanoi to Halong Bay. Organized tour options are plentiful, but the experience can vary widely depending on what you are looking for. We opted to join the Glory Cruise group which is a mid range tour and elected the 3 day / 2 night excursion. Most tour groups organize transportation to and from your hotel in Hanoi. 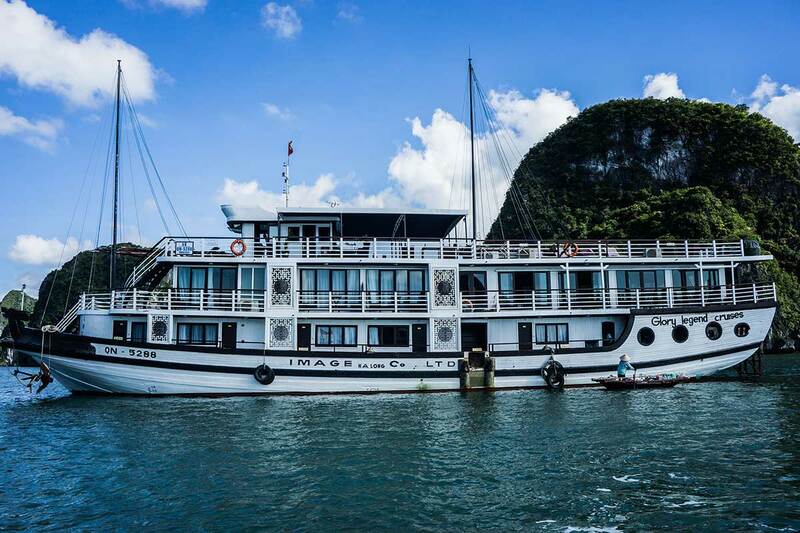 Glory Cruise - our home for two nights in the beautiful Halong Bay. The first thing that was noticeable about the Halong Bay cruise was that the waters were perfectly calm. If you typically suffer from motion sickness (like Josh), this is the perfect tour for you! Being in a bay we were sheltered the entire duration of our cruise from any roughness of the open sea. 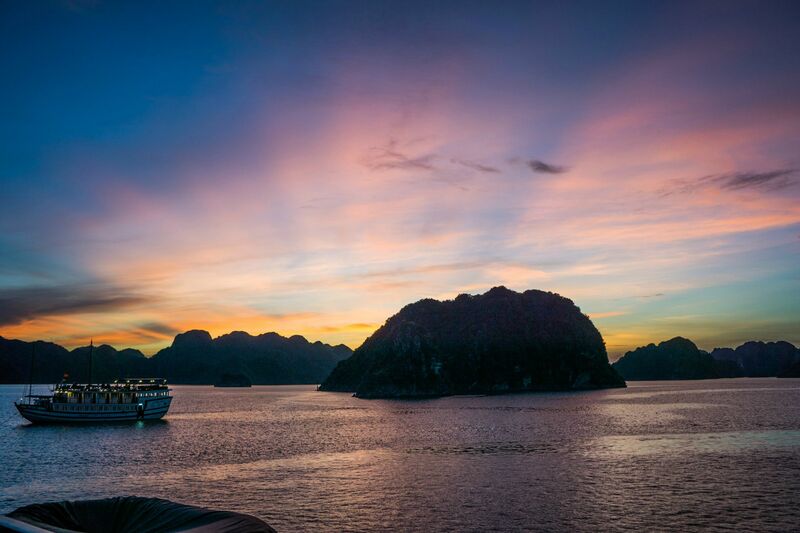 Sunset views from Halong Bay. If you visit Halong Bay, we HIGHLY recommend opting for the 3 days / 2 nights option, as the 2nd day was the highlight of our trip. The second day provides a much more remote and exclusive experience of the bay. We were able to hop on a kayak and explore the bay at will, navigating around many islands until we discovered a private swimming beach that we enjoyed in isolation! Ho Chi Minh (or Saigon, depending on where you are from) was a brief stop in which we wanted to arrange day trips; Natalie to floating markets and Josh to the Cu Chi Tunnels. Floating markets have been on Natalie’s list since she was younger, and riding on a tiny boat through the Mekong Delta river tributaries was a surreal experience. Natalie learned how local rice was made into rice paper and rice wine, and how coconuts were processed into coconut oil and coconut candy in a small village off the river. Cu Chi tunnels were part of a broader tour that provided a background and brief overview of the Vietnam War. It was amazing to see the tunnels as well as experience what it was like to navigate through them (you can barely squeeze into the tunnels, let alone walk through them). Many thousands of Vietnamese soldiers and civilians lived in the tunnels for the duration of the war. Many people that we encountered during our travels throughout Vietnam spoke highly of a small town on the eastern coast called Hoi An. Just south of Da Nang and a UNESCO world heritage site, the Old Town area of Hoi An is the main draw. We enjoyed biking and walking through the Old Town area, the contrast of colors with the historical sites and the blue skies was simply magnificent. Incredible contrast of colors in the Old Town of Hoi An. Hoi An is also one of the best places in the world to have clothing tailored due to the high quality and low cost. During our stay we had two suits made (for Josh) and two skirts made (for Natalie). It bears mentioning that if you plan to have anything custom tailored in most places, you need to have multiple fittings done – which likely requires multiple days. Josh’s suits required three fittings across three days, luckily we were in Hoi An for four days. 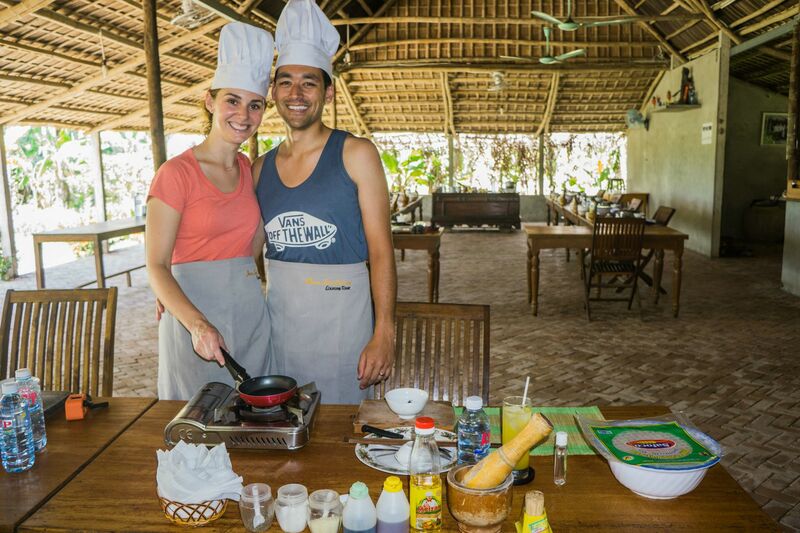 Hoi An was also the location of our cooking course which was a full day of learning to cook six different courses. We met some other Americans in the course and had a great time meeting the Chapman family and comparing travel experiences. Full day of learning to cook six different courses of traditional Vietnamese cuisine. After a three hour train ride from Da Nang we arrived in Hue which was our final stop in Vietnam. 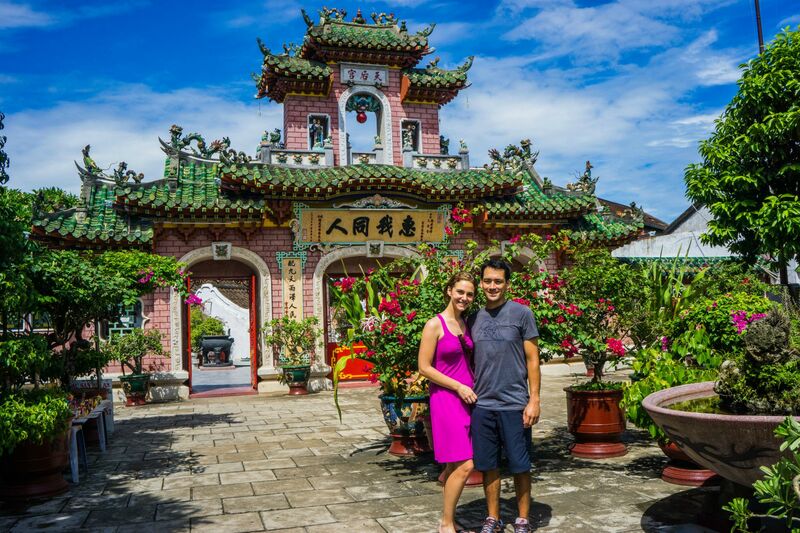 Spending only a few days in Hue, we continued with sightseeing around some of the historic sites. A favorite experience in the city was eating at the Buddhist restaurant Lien Hoa, frequented by monks. The cuisine was vegetarian, very tasty, and inexpensive. 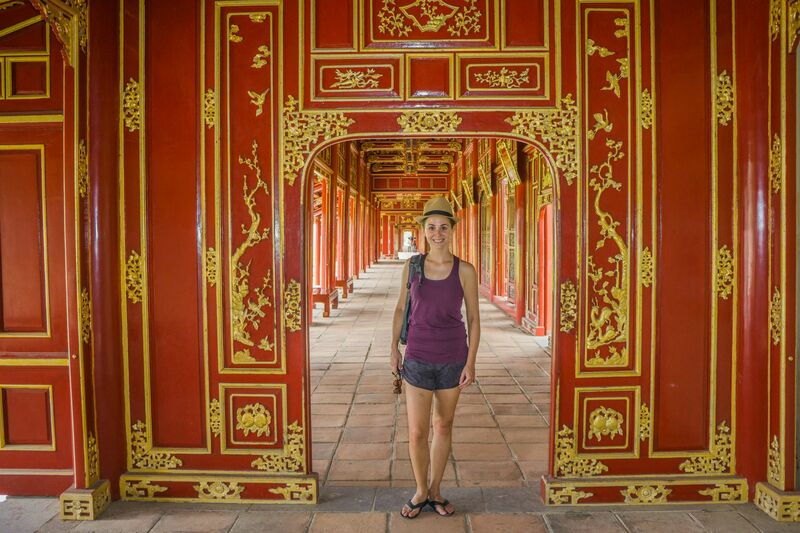 Natalie navigating her way through the Imperial City of Hue.